Belize NMS: Stationary front lingering over the Yucatan Channel will produce slightly more unstable conditions for Belize today. 24-hour forecast: Cloudy skies in the north today and sunny with cloudy periods elsewhere;partly cloudy skies tonight. A few showers will develop mostly in the north and inland areas today while elsewhere showers will be isolated. Winds: East to northeast at 5 - 15 knots. Today: Winds: E/NE 5-15 kts. ; seas: Choppy. ; waves: 2-4 ft.; a few showers(mainly north). Tomorrow: Winds: E/SE 10-20 kts. ; seas: Choppy - moderate. ; waves: 3-5 ft.; isolated showers. General Outlook: Through to Friday morning: Mainly warm weather with only isolated showers. On Ambergris Caye this morning its sunny, warm and the sea is calm. Our expected high is 86. We needed that rain, but it did not materialise.. . ..Now just a very few isolated showers occasionally. Although Caribbean air ( Blue ) still coming in from the East, fast higher level winds ( White ) overhead from the West. So there will be more cloud around than usual today.. . . . .Notice the ITCZ winds ( Pink ) that come out of those high cells in all directions. There was rapid change in the weather pattern overnight. The wind shift line approaching Belize completely collapsed. The wind this morning is continuing to flow in from the Caribbean. 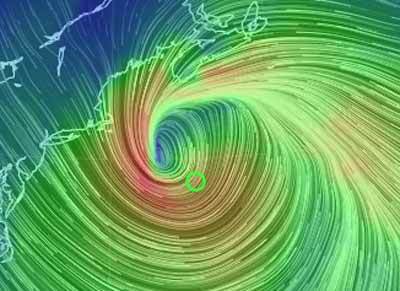 A powerful winter storm has formed off the east coast of New England (see image). Blizzard warnings are in effect. 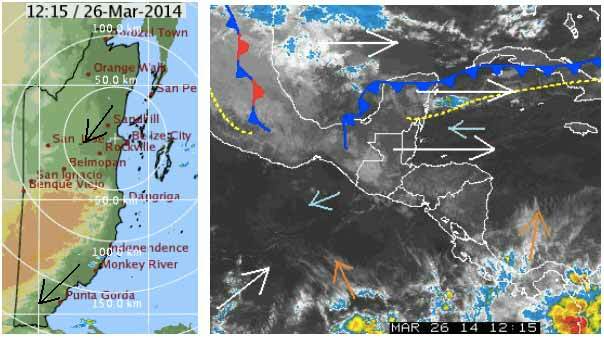 The Caribbean remains in a zone of very dry air. I am now getting concerned about heading into a severe drought. One extreme to another.